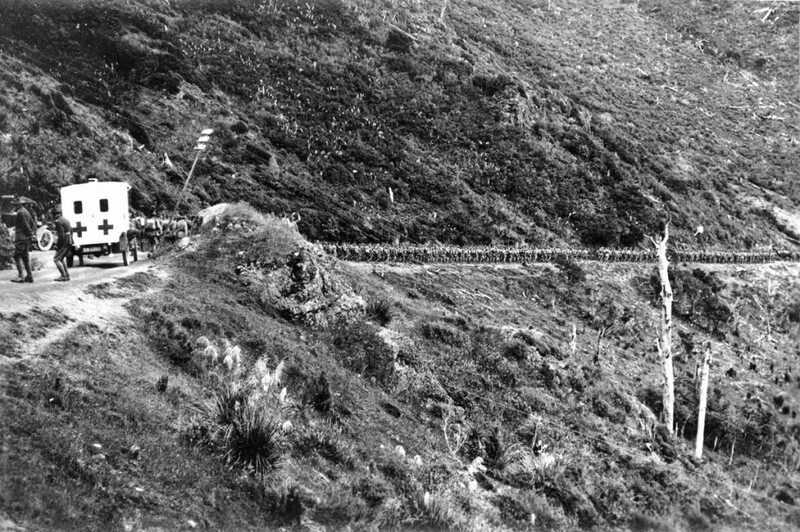 The 34th Reinforcement leaving the Rimutaka Road summit during the march from Featherston to Trentham. The first march began on 23 September 1915 (7th Reinforcement), starting a routine in which almost every reinforcement (1000-2000 soldiers) marched over two nights and three days to Trentham Camp, just before embarking for the front. The Wairarapa Patriotic Association provided a meal at the Rimutaka Summit on the first day. Route marches (a long march by a group of infantry) were normal parts of the training. The Rimutaka march became the final test of fitness and endurance for the infantry and included two night bivouacs, one at Kaitoke and one near Upper Hutt. The men carried fighting kit (rifle, ammunition, small pack, rations, water bottle) and carried out a mock attack in the Mangaroa Hills. The reinforcement would leave Tauherenikau (before January 1916) and later Featherston about 3am and reach the Rimutaka Summit about five hours later. After an early meal, the men would march down to camp at Kaitoke, having covered 27km. They marched in companies (about 200 men) and would take turns to lead the long column. An ambulance would pick up any injured man but few pulled out. A Featherston man, Frederick Rutherford (the little shoemaker) began to march with the soldiers, often leading the column carrying a flag. Over 30,000 infantry marched over the Rimutaka Hill – the last in April 1918. The marches were halted during the winters of 1917 and 1918. The influenza pandemic and the end of the war intervened to permanently end the famous march. The Rimutaka marches were usually photographed by commercial photographers and featured in weekly newspapers, making the marches some of the best remembered images on the Great War.